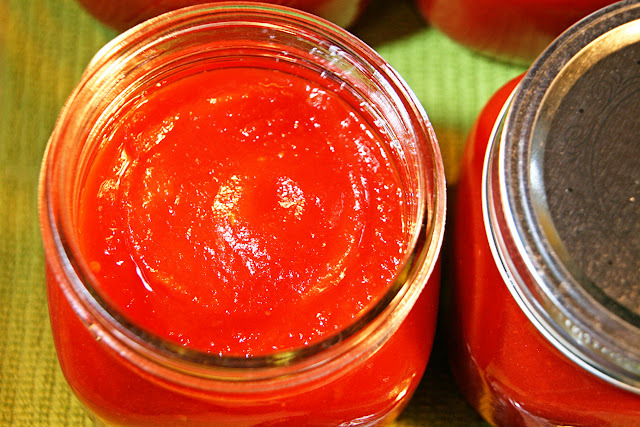 Ketchup is a really easy condiment to make, and making your own allows you to control the amount of salt and sugar added. And allows you to have the exact flavor you want. I often make ketchup to go with a particular meal, but this is the first time I have tried canning it. 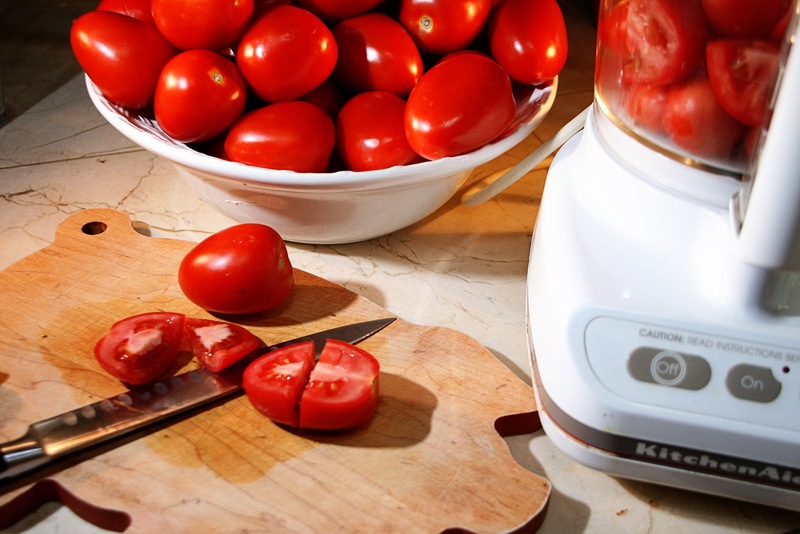 Cut tomatoes in quarters and puree them in food processor along with bell pepper. Strain puree through a sieve or a colander to remove skins and seeds. 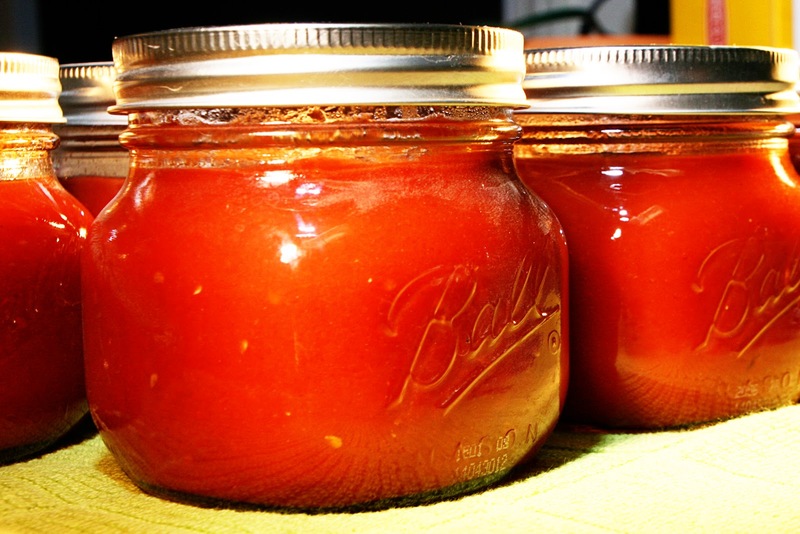 Now puree onions, combine with tomato and pepper puree, and pour into a large stainless steel or enameled kettle. Cook and stir occasionally over low heat until it is reduced by about a third and is considerably thicker. Meanwhile put garlic, peppercorns, allspice, cloves, and cinnamon into the vinegar in a small pot and simmer covered for 1/2 hour to steep spices in the vinegar. Pour about half the spiced vinegar through a strainer into the thickened tomato mixture. Stir. Also add sugar, mustard, cayenne, and salt at this point. One the ketchup has thickened, taste and add sugar, vinegar, salt or pepper to taste. Cook it some more, stirring often, until it looks like ketchup. Taste and adjust again. 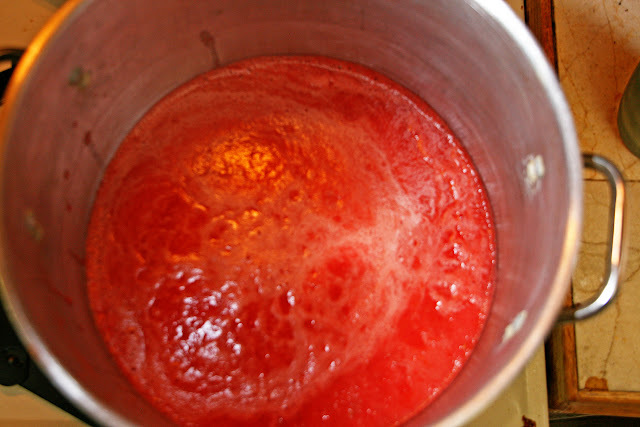 If the ketchup looks too separated, process in food processor again and cook for an additional 10 minutes. 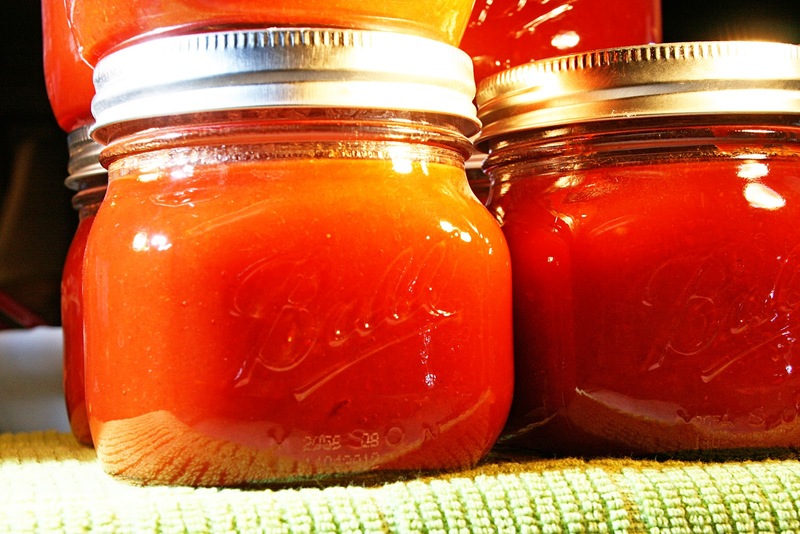 Transfer ketchup to hot sterilized 1/2-pint canning jars. This was really easy, and I made it just to my taste. I think this is a great first choice if you haven't done any canning. After all, who doesn't like ketchup?! This recipe was adapted from KetchupRecipe.com. It has never occurred to me to try to make my own ketchup! My grandma would can ketchup--in green 7-Up bottles. It was the most unappetizing-looking thing you can imagine to us kids. Good memories! Yours looks actually edible, like something I'd want to put on a hamburger! Love this! I have been wanting to try canning and make my own ketchup, so this post is exactly what I needed right now...especially since tomatoes are still in season! Thanks for sharing at Foodie Friends Friday. This will be my host favorite, so look for a shout out on my blog (www.familyfoodfinds.com) on 9/14! Beautiful tomatoes!! This is a great idea!! Thanks for sharing at Foodtastic Friday!